Today, Microsoft has released a preview of a newly redesigned version of MSN. The new MSN takes several design cues from Microsoft’s Windows 8 desktop operating system. The new layout is now less cluttered and more customizable, allowing users to add their own personal touch to their homepage. The newly redesigned MSN turns your homepage into a hub to access other products, like your email via Outlook, OneNote, and a variety of other Bing Apps. The company has also partnered with various content providers, including The New York Times, The Wall Street Journal, and CNN, to bring customers the latest news and alerts. Microsoft has also announced plans to launch iOS and Android versions of several Bing Apps, including Sports and Food & Drink. If you pick your favourite NFL team on MSN, scores and news will be available to you on any device regardless of the OS it is running. Microsoft has not announced a release date for its newly redesigned MSN website, however, the iOS and Android apps will be available to the public within the next few months. For now, anyone who would like to check out the preview of the new MSN, visit preview.msn.com. 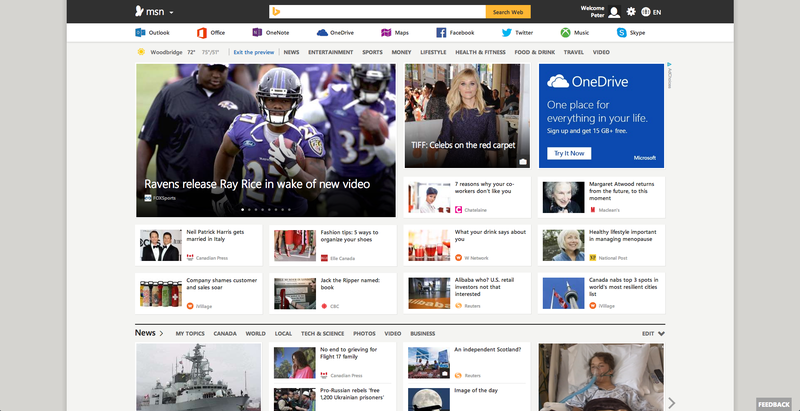 What do you think of the revamped MSN homepage? Let us know in the comments below.